Jenny (2015) is a video work which is filmed with one take using documentary method. The protagonist of this video is a construction worker who walked by chance into the frame during the take. 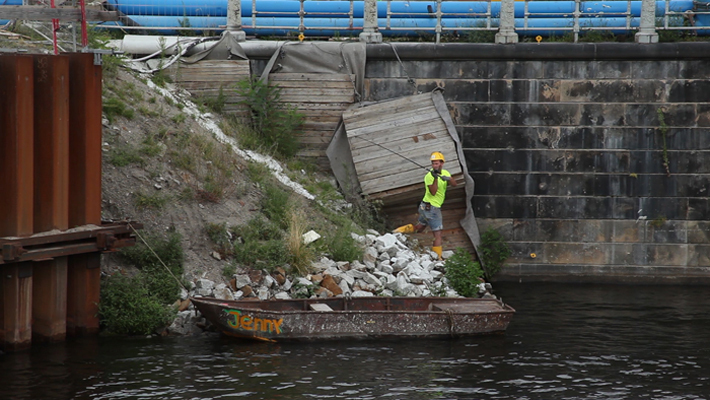 The worker who was having a break at Museum Island (Museumsinsel) in Berlin takes out his fishing equipment and starts fishing from the Spree river bank. The event is recorded in the summer of 2014 when there was a large-scale renovation and modernization project in the area. Therefore Jenny also serves as a documentation for an everchanging environment which no longer exists as it is shown in the video. Composer Ilari Edelmann’s music resonates with the soundscape of the surroundings and works as a counterpoint to the depictive image of the work.